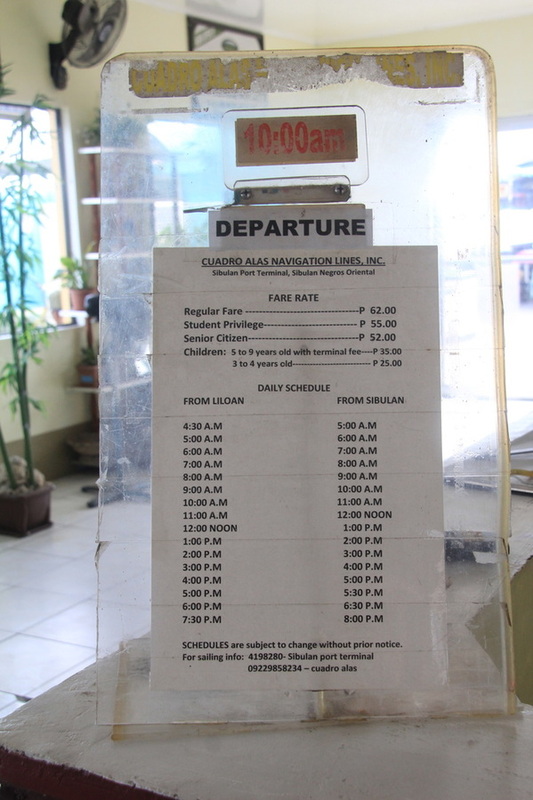 There are two ways to get to Sibulan port from Dumaguete City or Dumaguete Airport. You can either ride a multicab/jeepney or charter a tricycle for a special trip. Look for a multicab or jeepney heading to or passing through Sibulan. If you are coming from the airport, just walk up to the main gate leading to the main/national road. You should find multicabs to Sibulan passing through this road. Ask the driver to drop you off at the Sibulan port. There are 2 ports in Dumaguete -- Dumaguete Port and Sibulan Port. Make sure that you tell the tricycle driver that you are going to Oslob through Sibulan Port. Otherwise, they might take you to the wrong ferry terminal. 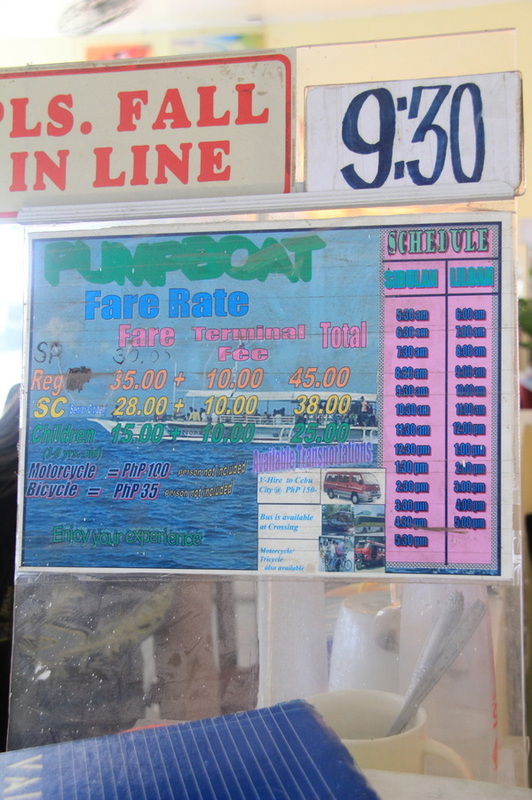 From Dumaguete, Sibulan port is around 15-30 minutes by tricycle. 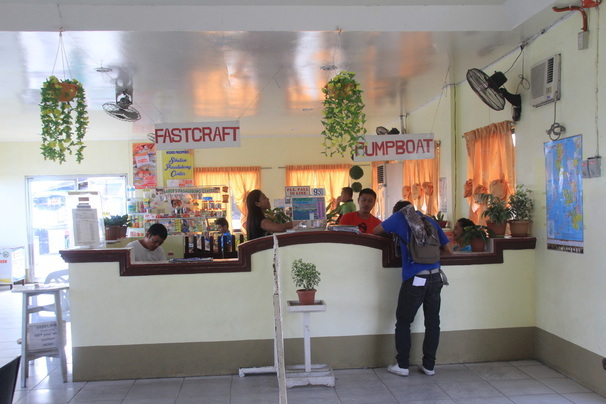 You have 2 options going to Liloan -- one is pumpboat and another is fast craft. Pumpboat is cheaper and slower but shouldn't take you more than 30 minutes. Please check the pictures above for the fare prices. Once you get off the seaport of Liloan, there are several tricycles that would take you to the main road for P10 per person. From the highway, take the bus heading for Cebu City. The drivers and conductors are well-versed with the resorts in the area so just tell them the name of your resort, and they will drop you off there. Tan-awan should be a short 15-20 minutes ride from where you boarded. 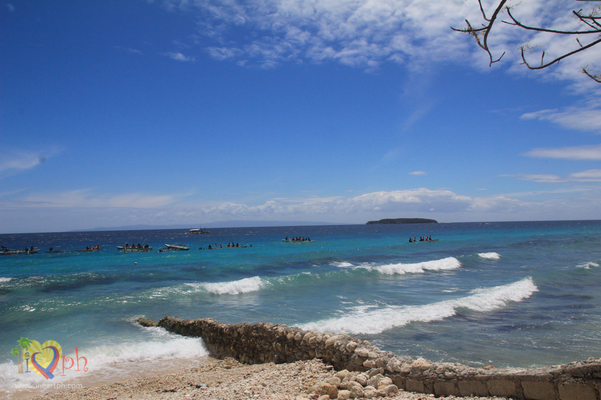 If you would like to book your boat beforehand, you can contact Kuya Jeff who is a tourist guide in Oslob. His contact number is 0998-559-7198 or 0923-530-6331. He also has a habal-habaland he could take you around Oslob's waterfalls and town proper. He could also arrange for your accommodation if you do not have the time. If you are planning to visit other places near Oslob, please check out my suggested itinerary of Oslob-Bais-Apo Island in 6 days.